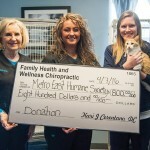 Family Health and Wellness Chiropractic was able to donate $800.00 to the Metro East Humane Society this April! We wanted to thank all our wonderful patients that contributed to a great cause and made this donation possible. From January to March, all $20.00 fees collected for new patients whom received a consultation, examination, and report of finding were set back to be donated to this wonderful organization. We were able to make a great impact on an organization that runs on donations. Together we can make big changes to our community, from health of our patients to the health of our four legged friends. To read the article that was posted in the Edwardsville Intelligencer about this promotion, click on THIS LINK!